SHAH ALAM, 14 May 2012 – Hypermarkets in the country including the multi-nationals have been called by small time women entrepreneurs to assist them market their products. 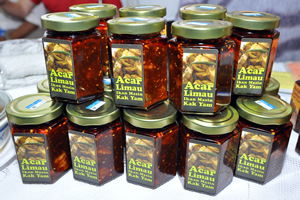 These entrepreneurs who are part of 1AZAM, a programme organised by The National University Of Malaysia (UKM), the National Council Of Women’s Organisation (NCWO) and the Women, Family and Community Development Ministry said they needed the nation-wide networks of the hypermarkets to get better exposure of their products. Some 300 women entrepreneurs including 1AZAM members took part in a two-day ‘lets trade’ (Jom Niaga) carnival for micro, small and medium entrepreneurs at the grounds of Karangkraf Publishing Company in Shah Alam last Friday and Saturday. 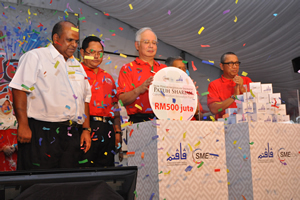 The carnival sponsored by the Ministry of International Trade and Industry and SME Corp, was launched by Prime Minister, Datuk Seri Najib Tun Razak. It was aimed at forging closer ties between the ministry, the various government agencies, corporations, SMEs and the public. 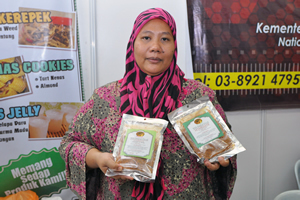 One of the 1AZAM participants, Noraziah Abdul Aziz, 40, told UKM’s News Portal that she started her snacks and condiments business three years before there was 1AZAM, but didn’t make much headway. Since being a founder-member of 1AZAM just over six months ago, the mother-of-one received aid to help upgrade her business and her output did grow but she faced problems in marketing the products. Although she saw more profits, it was mainly due to the free equipment and raw materials given by 1AZAM. Major retaillers like the hypermarkets were less forthcoming, sticking to paying the small time producers only six months after getting the products that they carry. She and other small traders find such payments too long to wait saying that payments of once every two months would be more reasonable. So far, only one supermarket chain that caters to the low-income group, had conceded to their requests and paid more frequently, but that retailer did not attract enough upmarket clients. As a result she at times just managed to break even. Much of their business were now done through word-of-mouth and help by friends and relatives to lobby for their products. As a result most of her business is done within Sungai Besi among the Malay neighbouhoods where she stays. Puan Noraziah is helped by her husband, who retired from the Army a few years ago and survives on a small pension. She refuses, to be deterred and still looks to the huge retailers as her salvation hoping they would help promote the products of micro and small enterprises. Another participant of 1AZAM, Siti Mariam Bakar affectionately known as Kak Yam, 60, echoed the same sentiments and doesn’t think they can compete with the big food suppliers. The feisty but aging entrepreneur said her husband, who retired from a utility company a few years ago and their two children are the only people working with her helping to distribute her products in Shah Alam. 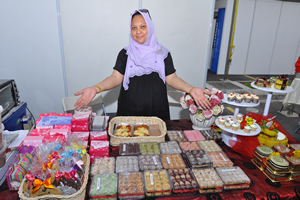 Kak Yam only wants to make enough to get by and maybe get her children interested in starting their own businesses. A majority of the micro and small entrepreneurs do not have their own business premises but use their homes to produce and package their products. Nevertheless, they are grateful to be part of the 1AZAM programme. 1AZAM was launched last October with 70 members to aid women petty traders in their enterprises. Visitors at the carnival had the opportunity to hear motivational talks by some prominent business figures who made good, such as film-makers Datuk Yusoff Haslam and Rosyam Nor and TV celebrity Chef Zam. Jom Niaga is the first of seven in a series of road shows which include Melaka on May 17; Tawau, Sabah (May 21 and 22); Miri, Sarawak (May 26 and 27); Jengka, Pahang (May 28) and Merbok, Kedah (June 19 and 20). Director of the Centre for Women’s Leadership, UKM, Assoc Prof Dr Madeline Berma said giving participants the tools instead of money would ensure they stick with the 1AZAM entrepreneurial programme. UKM’s Faculty of Economics and Management and the Centre For Women’s Leadership and NCWO who are also involved in the programme are committed to raising the socio-economic standards of women, including single mothers.